Hot Artichoke Dip - I apologize that this is only my seventh post and already I am making another of The Pioneer Woman's recipes. However, the real one at blame here is Trader Joe's, who wanted to charge me four dollars for a small container of Parmesan artichoke dip. 'I almost bought it, but realized that except for the cream cheese, I knew I had everything I needed to make it myself. 'Luckily the price on a block of cream cheese at TJ's is much more affordable than what they were charging for the dip. I am at a loss to explain why you should make this. 'I guess it's more of a question of why you wouldn't. I've had a lot of different restaurant artichoke dips before, and even the 'bad' ones are generally good enough to eat the whole thing and then be too full for the entr'e. 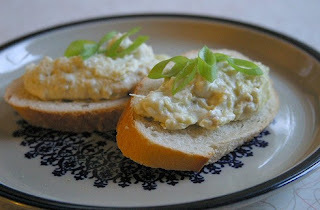 'While I don't know if I'd classify this one as the best of the best, it certainly fills that craving that only artichoke dip can fill, and it makes A LOT, so overall it is much less expensive than anything you'll buy at the store or a restaurant. Things I did differently: I left out the cayenne because I'm a wuss with anything hot, and I used light cream cheese, well, for no good reason at all. 'I imagine it would taste better with regular. 'Things I would do differently next time: I would use at least one more kind of cheese, probably Asiago or Fontina (or both), and I might add a little lemon, just to brighten it up a bit. Preheat oven to 350 degrees. 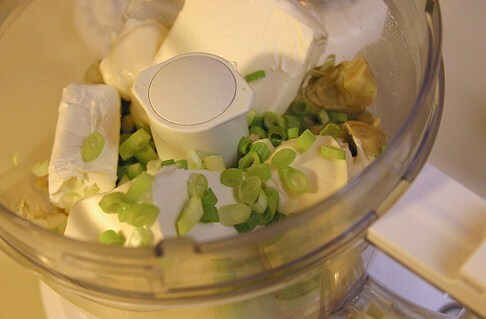 Add one can of the artichokes, the cream cheese, and the mayonnaise to the food processor. (If you don't have a food processor, do smaller batches in the blender, or simply chop and stir together.) Sprinkle in cayenne pepper to taste. Add the green onions to the bowl as well. 'Pulse the mixture 6 or 7 times just enough to get everything mixed. 'Mix in the Parmesan and add salt and pepper to taste, and set aside. 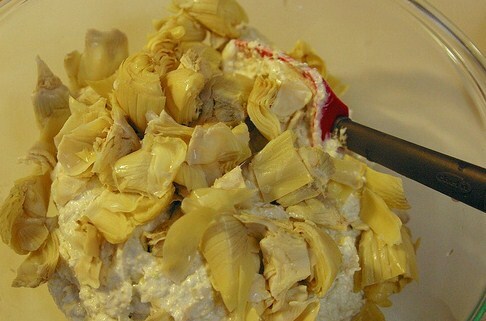 Now, roughly chop the artichokes from the remaining can. 'Add the artichoke pieces to the dip and stir together until incorporated. 'Pour the mixture into an oven-safe dish and bake for 15 ' 20 minutes, until heated through and bubbly. ' Serve with a baguette, tortilla chips, or your favorite crackers.